As your content repository extends, you can take advantage of Document’s robust searching features to find your files. Documents searches your My Workspace and all of the group workspaces to which you belong. All of the matching files appear in a consolidated list for you. In the Search Documents box, type a simple search. For example, type the name of the file or the name of the author. For more information about how to create a simple search, see Search examples. Note: Documents uses full-text searching on this string. Select the workspaces that you want to search. To select a workspace, hover over it and then click its selection button. Your search results appear in the Search Documents page. You can now use views and filters to refine your search. To see all of the files in all workspaces, do not select any workspaces. To see all files within the workspaces you selected, do you not type anything in the Search Documents box. Documents searches for matches in the file title, created by name, file type, and tags. Documents also uses full-text searching which searches the actual content of your files for the text you specify. In either case, capitalization does not matter. da, Da, or DA Files created by David Smith, files named Daily Report, and files tagged data. Note: You do not find files from 2012 unless “12” appears in one of the fields that you searched for. 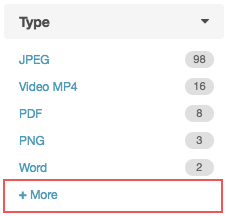 After you search you can select views to see the documents that match the view criteria. For example, to search for reports that are in your My Workspace, first search for “Report.” Then, on the Search Documents page, click My Documents. When you apply a view, it appears above the file list. You can apply multiple views. To see more results, you can remove views. To further refine your search results use filters. 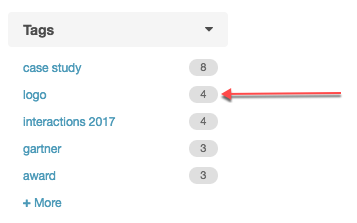 Filters let you refine your search based on specific criteria. To select a filter, click its name in the list. The number next to a filter indicates the number of matching records. Note: The more filters you click, the fewer matching files you see. For example, if you select the facets, “Content Type = PDF” and “Date Created = In the Past 30 Days,” then only the files that match both filters appear in the search result list. 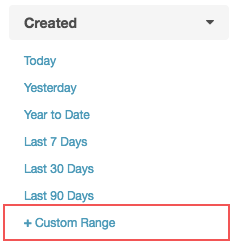 To define a specific date range, click Custom Range. To see more filters, click More. Remove filters if you do not see enough results. To restart the search, remove all filters and then type a new search string.